Nice shots of the ISS. I apologize for my late EVA coverage today but my DSL connection kept dropping earlier and my browser crashed once or twice It was fun to cover these EVAs during this mission and I hope to do this again for STS-126 (assuming its launch date and time stay in early evening, late afternoon EDT or EST time), thanks again everyone! Crew lock repress starting now. 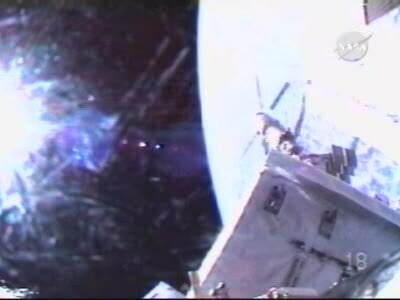 EVA was 6:33 in duration and is now ended, airlock is repressurized. All scheduled tasks done plus some get aheads (4 1/2 get aheads). Total EVA time for US astronauts on ISS is now 706 hr and 36 minutes, 112th EVA on ISS by US astronauts, 197th EVA by US astronauts. Ron Garan now at 20 hr 34 min/3 EVA's, Mike Fossum is at 42 hrs. 1 min./6 EVA's. Thanks Ford, Chris Bergin, Richard, and everyone else - great coverage of this flight so far. The next EVA's we'll be seeing by shuttle astronauts will be on the big Hubble repair job - STS-125. I'm looking forward to that one! Mission briefing moved up to 5:30 central. Mission Status Briefing coming up now. Ingress tomorrow for JLP along with JEM RMS Final Deploy and brake check. 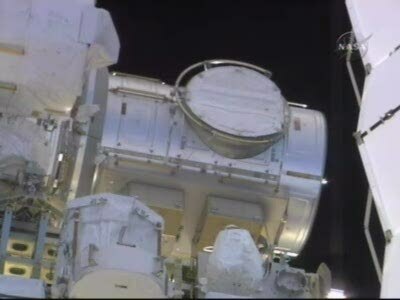 Vestibule work between Kibo and JLP done today along with EVA tasks. Very successful EVA, successful set of EVA's, "went extremely smoothly". 20 hr 32 min total EVA time for this mission. Very happy with the performance of the gloves on the mission. 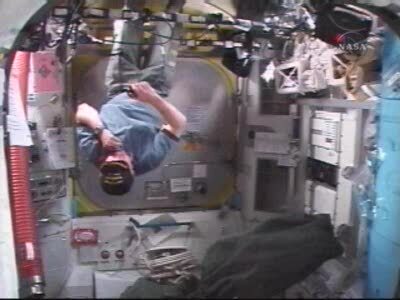 Seems like all the astronauts are having fun trying to get things to be still in micro-gravity. The whole meal, there's been at least one, and usually two or more, food containers floating out in the middle, with one or another of the guys tapping or poking it trying to cancel its momentum. Which is fun when the tuna can is open and bits of food start flying out. It's cool that CDR Kelly was wearing a ball cap from USS TUCSON (SSN 770) today. Very appropriate as well since Tucson is in his wife's Congressional district. Do You think this ball cap had own political background?! Change political for sentimental and you might be right. That first image (s124e007252.jpg) has got caption competition written all over it! Pre-photo: "Now lie down on the floor with your EMU gloves where I can see them. Photo taken: "Oh, hiya Ken! Yep, this is a much more fun way of doing a glove check."